It’s National Cheeseburger Day today! I’m celebrating with a new cheeseburger recipe on the blog! 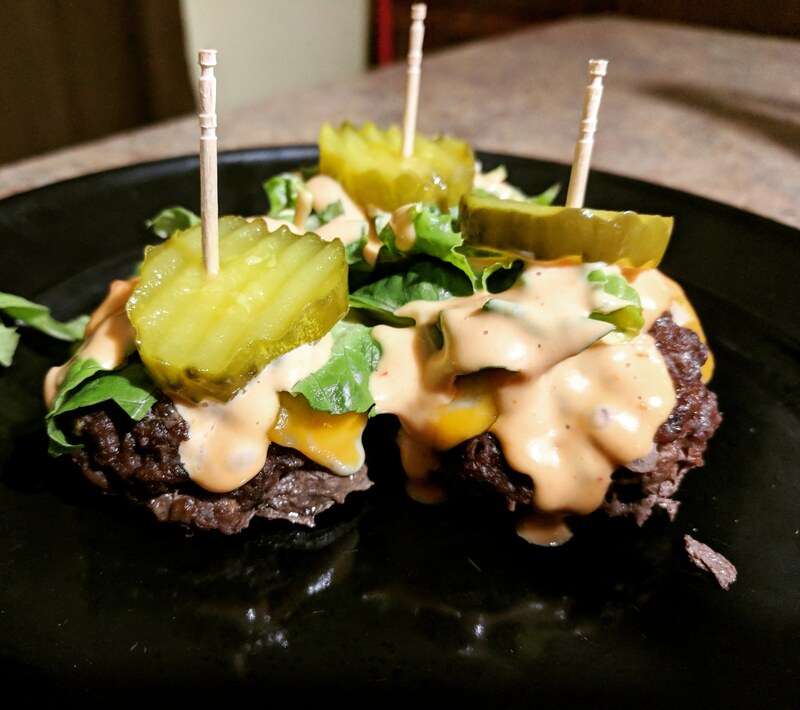 Big Mac Cheeseburger Bites are basically meatballs topped with cheese, pickles, lettuce, and thousand island dressing. But SO good. This is a super duper easy recipe and fabulous for those chaotic weeknights. If you are organic, strict Keto, or natural-food seeking, using a store-bought Thousand Island Dressing is probably not your cup of tea. It’s got bad stuff like corn syrup and soybean oil in it. However, if you are lazy Keto or just seeking fast, low carb options you can opt for this because it is still low carb as far as the nutritional facts go. I use Walden’s Farm Thousand Island dressing, although it still has soybean oil in it, it’s sugar-free and doesn’t have the corn syrup. It’s “kinda” keto-friendly. Plus, no carbs! Y’all, I totally lazy Keto so this does well for me as an in-between strict and lazy Keto product. Otherwise, it’s super easy to make your own too! In a large bowl combine ground beef, onions, and dry seasonings. Mix until combined and then rolls into balls.Press each one down slightly to flatten it to make a mini burger patty and place it on a lined baking sheet (I used parchment paper). Cut each cheese slice into quarters and place a square on each mini patty. Place back in the cooling oven and let the cheese melt. Top with pickle slices and shredded lettuce, drizzle thousand island dressing over.